Our current plans are that the bricks will be made of a high-quality stone and look similar in style to the sample displayed. What are the brick dimensions? 200mm wide x 150mm tall x 50mm deep. How many characters can be engraved on the brick? It is envisaged that each brick will contain a maximum of 48 characters. In this scenario, characters will be divided into three lines of a maximum of 16 characters, including spaces. How can I personalise the brick I purchased? 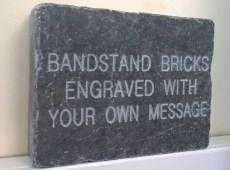 After purchasing your Bandstand brick you will have the opportunity to download a certificate to mark your purchase. Once sufficient funds have been secured for the restoration project, we will contact you regarding details of the final plan for the bricks, including your personalised inscription.